I honour the hon. Member for Dagenham and Rainham (Jon Cruddas) for giving a good defence of many of the good elements of the big society, and a good warning on some of its dangers. Much of the debate, however, reminds me of sitting in a room with a group of philosophers looking at some bird and explaining why the bird cannot fly. Again and again, I come to these debates and hear people say, “The big society cannot work, because people do not want to take responsibility”—I take the point from the hon. Member for Newport West (Paul Flynn) about people not wanting to save a child from a pond—or they say, “It cannot work, because they do not have the resources or expertise”, or they say, “It ought not to work, because if these communities were trusted, they would do the wrong thing.” So there are three kinds of argument: communities do not want to do this stuff; they cannot do this stuff, because of cuts; and they ought not to do this stuff, because they will do something irresponsible. For example, in debates on planning, we hear again and again that communities left to their own devices would build a concrete jungle or act as nimbys and block all development. There are many good points here. The Opposition are making many good points. The big society is not a replacement for everything; it is not a silver bullet or a panacea. We need a state. I will list three of the many things for which a state is very important. First, we need a state where there are issues of expertise. For example, brain surgery is best left to the state, not a community. Secondly, where massive resources and big strategic decisions are required, such as in the building of highways or high-speed rail networks, things are best left to the state, not individual communities. Finally—this is where I pay tribute to the hon. Member for Dagenham and Rainham—the state is important when it comes to the protection of the vulnerable. Our democracy is based not just on majority representation, but on the protection of minority rights, and for that a state is very important. Nevertheless, despite the fact that some communities might not want to do these things, despite the fact that some cannot do these things, and despite the fact that some might make the wrong decisions, big society is a wonderful thing. To those philosophers who say that this bird cannot fly, I say that it does fly. They should come to Cumbria or go in fact to any constituency. As was pointed out in an intervention, we can all see again and again exactly what big society is about. It is not about the state; it is not even about the voluntary sector, although it does a wonderful job; and it is not about individuals or businesses. It is about communities and community action. Why does it work? Why, if someone comes to Cumbria, can they see in Crosby Ravensworth a better affordable housing project built by a community than would have been built by the county council on its own? 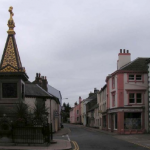 Why, if someone comes to Kirkby Stephen, can they see a really smart neighbourhood plan—not one pushing for a concrete jungle or a nimby objection to any development, but one sensitive to the vulnerable and imaginative in how it does its development? And why, if someone comes to Appleby, can they see wonderful renewable energy projects? It is because those projects are different from those done by the state in exactly the three ways I mentioned—in the degree of knowledge, in scale and in their relationship to the risk to the vulnerable. These are projects in which communities have a competitive advantage over the state because local knowledge matters in those projects. It is very important to live in a place in order to produce a really good plan for that place. The people who live there know about the place and care about it. They come up with creative solutions, street by street, on where to place a school, on how much housing to allow and on who will live in the affordable houses and where they will be located. It also really matters that people care about these projects. Communities want their children to have a house in a way that a distant expert does not. Finally, although it is difficult to quantify, I think that all of us—as politicians, as opposed to civil servants—understand the will and the desire in communities to make things work in a way that a distant expert might not. This debate should be familiar to the Opposition. There is a very distinguished tradition on the left of believing in people, of not being pessimistic about them, and of not being over-optimistic about technocratic, centralised expertise. There is a tradition of understanding that there is of course a place for the state, but that there is also a place for the community, and that that does not just involve mowing the lawns. A patronising idea is sometimes expressed that communities can be trusted to do only small, limited things. In Cumbria, we bang on about what we have done with broadband because it is an example of communities, not the state, delivering a highly technical, highly challenging engineering project for a fraction of the cost and in a fraction of the time that the state would have taken. That has happened because the parish can ask people to do things in a way that the state cannot. The parish can ask communities to take out loans to pay for some of their own broadband, it can ask farmers to waive their way leave in order to get the fibre optic cable to the houses, and it can ask the church to put the transmitter on its roof. In that way, the price can be reduced fivefold. And this is just the beginning. There should be a resonance between both sides of the House over our scepticism of expertise, and over our understanding that there are forms of knowledge, not theoretical knowledge, but “knowledge of how”—“capacity knowledge”, forms of caring, of will and of desire that are not a replacement for the state but that, in the right place and the right circumstances, can achieve miracles. 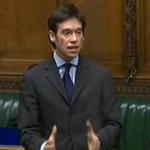 Paul Flynn (Newport West) (Lab): In listening to the hon. Member for Penrith and The Border (Rory Stewart), I had great difficulty in finding any connection between what he was saying and the subject of the debate. He cited three splendid initiatives, but presumably they all took place under the last Labour Government. 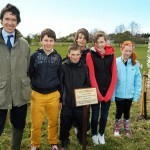 Rory Stewart: They are three examples from the big society vanguard project in the Eden district of Cumbria, initiated by this Government, and the hon. Gentleman is very welcome to come and see them. My opposition to wind-turbines used to be merely theoretical. I understood that they were an inefficient way of generating energy and that companies pushed them into inappropriate places, against the wishes of communities, because of extravagant subsidies. But Britain desperately needed clean energy. I knew struggling farmers, for whom turbines could bring enough income to save a family farm. And friends told me I was out of date and that was not taking the environmental problems seriously. And so I was confused. I am no longer. My visit to Reagill has turned my theoretical opposition into something deeper. Penrith and the Border should be a turbine-free constituency. Standing above Reagill, you can see the horizon from Blencathra to the Pennines. Nothing breaks that silhouette and, although it is the largest constituency in England, you can see almost every mile of it: an unbroken sweep of rolling hills, clean to the mountain ridgeline, without industrial machinery. It is almost the last constituency in Britain where this is true. In Scotland, the crest of the wild and empty hill of bracken above Glendevon, is visible for 3,000 square miles around – from the Sma Glen to the Pentlands, South across the Forth: and for 3,000 square miles around you can see that it is crowned by giant white turbines. We are a densely populated island, that industrialized heavily and early, and has no Alps, no wilderness, no Himalayas. Since Wordsworth, the British have found their escape and freedom in our Cumbrian landscape. People still want to move and retire here; live and die here – because of the purity of the space. It is a human-made landscape, sculpted and tended by farmers, but the human hand is hidden. It consists of pure expanses of open ridge lines, framed by mountains, but it is in reality, small in scale. As Auden says, this is a limestone landscape ‘where everything can be reached or touched by walking’. If 400-foot industrial turbines –taller than St.Paul’s cathedral – whir on three hundred foot hills, sending flickering shadows over the valleys, all this is altered forever. Everything around will be industrialized, domesticated, humiliated and diminished. The hills will seem, under these great lazy robots, like municipal parks in the shadow of a ferris wheel. So what? During the election my opponent and friend said to me: “You can’t pay the bills with the view, my lad”. Turbines seem to promise great environmental and financial benefits; they are astonishing technology and starkly beautiful; they epitomize modernity. Carbon dioxide emissions are driving climate change and could destroy the lives of billions: we are not even beginning to properly reduce emissions. Our constituency has some great renewable projects – geothermal in Gamblesby, solar in Bolton, wood in Alston, hydro at Bongate weir – but they do not begin to suffice. Even the contribution and sacrifice that Cumbria has made in nuclear generation is not enough to solve Britain’s problems. 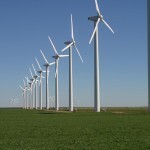 The arguments for wind-turbines seem hard-headed, practical and moral. Are we, therefore, simply being foolish, sentimental, selfish? No: because if we kill the magic of Cumbria by driving four hundred foot steel stakes into the heart of our landscape, we lose more than sentiment. For a start, we will lose money. Tourism is the largest income earner and employer in the constituency and the landscape, which we will be wrecking, is what the tourists pay to see. They come now to visit one of the last upland areas, in which it is possible to see how Britain looked before the wind-turbines. But what moved me most on Saturday above Reagill, was not the hills, or tourism but the fierce commitment of the anti-wind farm campaigners themselves. Once you have met them – grasped the time they have given, the research they have done, the opportunities which they have passed up – the way they live their lives – you would not call them nimbys. When they talk about the skyline, or point to the birds on Winter Tarn, or discuss their support for the fights of other communities from Shap to Stainmore, they are neither sentimental nor selfish. They are people whose lives are concretely absorbed in their landscape: aware of its shape, its heft, its space. They loved it – as millions of others loved it – and will love it. I know people will struggle to understand why we should make this a turbine-free constituency. But the best reason to block the developers is the love of such communities for their own place. I have undertaken to steer clear of party politics in my column but you have invited me through Joe Ravetz’s letter last week to explain my national positions. Anyone wanting to know my views in detail please write to [email protected]. In brief, I am strongly in favour of the academy schools because I believe in giving more freedom and responsibility to teachers (we have gone too far towards central control in most of life). I will support any schools interested in converting: three have already approached me, and I have helped to convince the Secretary of State to make an exception for one. I also support GP commissioning: Cumbria has taken the national lead on this issue, with good results. But since this is a hefty, complex piece of legislation, (which is now being scrutinised by a House of Commons committee) I would welcome input from constituents to feed into the final Bill. I definitely do not agree that the BMA and the King’s fund are “simply…people with vested interests”. I agree there was an inherent unfairness in withdrawing child benefit where one parent was above the 40% tax bracket; but the existing PAYE and Self-Assessment structures are the best way to ensure that Child Benefit continues to be paid to families who need it most, while avoiding the complexity and expense of means-tests. I voted on February 2 t reject an opposition amendment and support consultation on forestry (you can see the full-text of the amendment, for which I voted at here ). I am pressing for the full protection of Cumbrian heritage forests, and the full protection of access, and biodiversity in all our woodland. I have insisted on this with ministers and in a joint letter signed by me and all Cumbrian MPs. Following meetings with Save Lakelands Forests, the Forestry Commission and the National Trust, I am now bringing together a detailed submission for the government on forests in our constituency, on the basis of hundreds of constituents’ contributions. Finally, Mr Ravetz comments on my focus on local issues. I have three foci: first, to give more freedom and power to local communities and parishes (because they generally know more, care more and have more commonsense than distant officials); second to defend our facilities (such as Newton Rigg and the cinema), our services, our farms and our economy through difficult times; and third to make the investments – in particular in superfast broadband and affordable housing – which can help our services and drive our economy in the future. These will continue to be my priorities. I am proud to be a local constituency MP. That is where I believe I can currently be most useful. Rory has issued a statement in support of the county’s many Teaching Assistants and Learning Support Assistants affected by Cumbria County Council’s review of job profiles and terms and conditions under the Single Status ‘Job Families Allocation’ review. He has responded to queries from a number of concerned constituents by contacting the Chief Executive of Cumbria County Council, Jill Stannard, to press for an urgent re-assessment of the categorising of assistants in the education sector. Rory has also asked for clarification on the definition of a full-time 37-hour week, and for information on the annual leave entitlement. Historically, the working week of teaching staff amounts to 32.5 hours, and annual leave entitlement is defined by school holiday times, and so both issues directly affect those whose jobs have been allocated within a new job ‘family’. 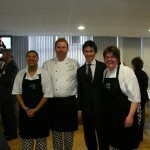 Rory opened the new Penrith Headquarters of the Cumbria Partnership NHS Foundation Trust on Friday 11th February 2011. He was also shown the innovative developments in mental health and learning disability services in Cumbria. Trust Chair Bryan Betterton launched the first issue of the Learning Network’s new research journal which publishes research from eminent clinicians, and Rory Stewart also visited the new Café Inspire. Operated by Eden Mencap and staffed by volunteers who are gaining work experience as part of the BakeIt programme, Cafe Inspire provides a training environment for young adults who move on to part and full-time work in other environments. Presenters at the event include Consultant Clinical Psychologists Professor Dave Dagnan, Ron Siddle, and Dr Richard Thwaites, on subjects including dementia, early intervention in psychosis and improving access to psychological therapies. The event also outlined ongoing plans to ensure that staff are supported with high quality training opportunities that enhance the care provided to patients. Rory backed the UK’s National Apprenticeship week initiative with a visit to Cranstons in Penrith last Friday. At Cranstons Rory donned apron and gloves and was shown by apprentice Chris Mitchell how to fillet and stuff a chicken ready for sale. Rory met and chatted with butcher apprentices at the Penrith food store, and talked to staff, managers and trainers. 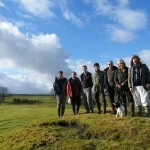 The walk organised by CARST showed local MP Rory the 50-foot high anemometer mast, recently erected at Reagill by Nottingham-based Pure Renewable Energy Ltd to gather data to support an application for a wind farm. Original plans indicated that eleven turbines, two and half times as high as the mast, were being proposed. CARST Chairman Jason Hill welcomed Mr Stewart and thanked him for taking the time to visit the site and to see for himself the prominent position above the Eden valley that was being proposed for the turbines. Walkers were able to see that any turbines would be visible from the Lake District National Park, the North Pennines Area of Outstanding Natural Beauty and much of the Eden Valley. 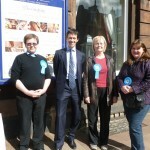 Rory Stewart praised the work of CARST and said that he hoped the same energy he had seen in action could be harnessed for positive good once this campaign was over. Nothing that I have done in my short time in parliament has been as exciting or as fulfilling as broadband. My constituency of Penrith and the Border is the largest in England and consists of over 200 villages. Our greatest problems stem from distance and isolation. My neighbour with Parkinson’s has to drive to Newcastle Hospital – a four hour round trip – just to chat to a neurologist. Village schools are closing: children have to travel ever further and find it more difficult for them to stay after class. We are struggling to keep young people in villages partly because of the low wages (some of our hill-farmers have incomes of less than £6,000 a year). Superfast broadband is an answer to so many issues of isolation. It is not just that we could attract new businesses, such as production companies, that need super-fast connections: farmers could fill forms online; our food shops could market themselves in Europe; patients could talk to hospital consultants down an internet video link, without leaving home; children could take classes, which they couldn’t find in the county; and people might decide again to work and bring their families up in villages. But because we are not simply the ‘last third’ in the country but probably the ‘last twentieth’, neither government nor telecoms giants, have ever been able to come up with an affordable and efficient scheme. This situation is being turned around by our communities. Daniel, Brian and Cybermoor in Alston were among the earliest movers in the country – digging in fibre themselves at a fraction of the cost quoted by commercial companies. Then Miles in Great Asby – twenty-five miles away – launched its own network. Again they were in an area without a fibre-enabled telephone cabinet, dependant on copper wire and never able to acquire broadband. But they uncovered an entire alternative fibre network – separate from the commercial system – running to the local primary school. They broke out from that fibre, designing their own new wireless networks strung from belltowers, dug their own fibre trenches (at a fraction of the cost), signing up record numbers of residents for the service. As the local MP, I held a broadband conference in Penrith in September to promote Cumbrian efforts to ministers and companies and even senior American officials. But things only really took off when we got a hundred and twenty more Cumbrian villages to visit Great Asby and study the model. Almost all of them have now decided to launch their own schemes. They have flooded into our new website . Different groups have mushroomed online to explore and propose almost every conceivable solution and dimension of rural broadband. Thane is focused on building infrastructure, Libby on travelling around, recording existing cabinets, a Penrith company is working pro-bono to provide a complete detailed map of the fibre (which we could not get form anywhere); Kate on getting more people online: still others are looking at piloting new government services online from health to education which could transform services in rural areas. A single proposal from Barry to build his own independent fibre backhaul has drawn in nearly 300 posts. Even more encouraging is the fact that rather than being simply terrified of this anarchic burst of creativity and community enthusiasm, government seems to be excited. Our Eden communities have been formally recognised as the national rural ‘Big Society’ vanguard, and a team of Whitehall civil servants has been assigned to support us. We have been made one of four national broadband pilots and we have received financial support from the treasury. At a national level are discussing opening up ducts and poles to allow new networks to be laid; they are exploring how to allow communities to build their own networks and then connect them to pre-existing fiber-optic cable at an affordable rate. Some of the big companies are responding to this competition by offering prices and technological solutions and compromises which seemed inconceivable a few months’ ago. At a local level, the government is considering what changes we could introduce to allow families to string fibre to their homes, easily and affordably, even where a big telecoms company owns the cabinet from which it runs. And different departments are looking at piloting more and more of their new programs in our area: medical tests from homes, taking new services online, developing new business applications and even dealing with justice. Mapping, installing and negotiating broadband is now so central to my life as an MP, that I have had to recruit and fund a full-time broadband team. But there are still very serious and difficult questions. Will each village be allowed to choose whether to have a community-owned loop? Will subsidies distort the eventual outcome? Would they be allowed to clip affordably onto existing commercial fibre? Will companies provide them with services like TV? Will central or county government stifle parish solutions? We need to go far beyond pressing the county council (which is running the procurement) to answer these questions. We also must ensure that the vulnerable are not excluded; that alternative methods of communication from letters to buses continue to be supported; and that the community networks do not simply become new monopolies. The technological, commercial, financial and legal problems are vast. Idealistic activists, civil servants at all levels, and giant companies all don’t always trust each other and don’t always compromise enough. But if we may be unable to achieve all of our dreams, I still think we can achieve far more than we feared six months ago. 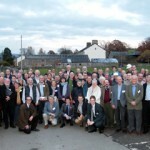 Every meeting, every initiative, the energy of a hundred people and every post on broadbandcumbria.com, proves and reconfirms the drive of Cumbrian communities. I have little doubt that they will now give the most sparsely populated constituency in England the fastest broadband network in Europe. That in the process they will redefine our approach to technology, to finance, to legislation, to procurement, to monopolies and to the relationship between governments, companies and communities. And that this technological and democratic miracle can spread across rural Britain. Please join us, sign up as a member on our new website and join the discussion.